Israeli PM says Israelis "greatly appreciate" US President's decision to withdraw from Iran nuclear deal. 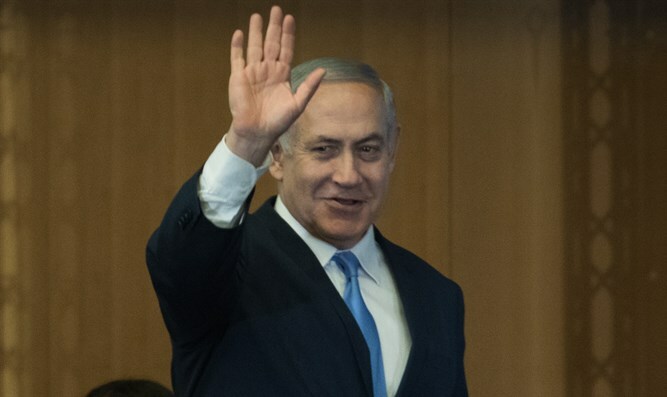 Israeli Prime Minister Binyamin Netanyahu praised US President Donald Trump's decision to withdraw from the Iran nuclear deal Tuesday night. "President Trump's decision is a courageous decision and a right decision," said Netanyahu. "The people of Israel greatly appreciate this decision." "If the agreement had been maintained, it would have allowed Iran enough material to develop a full arsenal of bombs," Netanyahu added. Trump announced that the US was withdrawing from the 2015 nuclear agreement and reinstating sanctions on Iran during a White House press conference Tuesday. He cited the deal's sunset clause, inadequate inspection provisions, and failure to deal with Iran;s ballistic missile program and support for terrorism in his decision. The president also cited Prime Minister Neyanyahu's presentation of Iran's nuclear archive last week as proof that Iran cannot be trusted to abide by its commitments under the JCPOA or to abandon its desire to develop nuclear weapons.